I moved down to the Village of Leesburg back in 2012 from the northwest part of Ohio. I became employed previous to my move and have worked here in Leesburg going on four years. I grew up hearing ghost stories and always believed them to be fairy tales until I began working nights at my place of employment. I first became aware of odd things happening at my place of employment. There are things that make the hair on your back stand up and give you goose bumps. While working nights I am by myself and have come to pay close attention to detail and while sometimes spending ours inside this building I continued to hear and see things that I believed my eyes were playing tricks on me. I asked around and spoke with other co-workers to see if they had previously experienced any odd behavior while inside the building. All of them had some type of experience of activity, all grown men and women who made chilling statements of things heard and seen. Just to name a few off the top of my head, a co-worker stated that one night before leaving to go home around 2:00 am he had forgot his car keys inside the building and had returned. With all the lights out he observed a dark shadow standing in the door way. That same co-worker stated that every time he used the restroom it had felt like someone was standing behind him breathing down his neck. A few years down the road after that, the co-worker had left for other employment. A new hire had asked me if I had ever experienced anything odd. The new hire stated that he had swept all the floors in the building and being a weekend no one else was at the building. When the new hire returned back to the building later he observed foot prints. There were footprints that were small and narrow coming up from the basement. This new hire took photos of the footprints, and the walking distance between the footprints were almost three feet. Some other things occurred with the new hire, such things as finding open doors, hearing mysterious noises later at night. For the next several years this had been a continuous routine that we all seemed to just adjust to. I have experienced nights of footsteps walking down the hall while the sound of banging on walls and have seen a shadow figure of a man walk from one room to another. I have come back to find doors open and have heard just odd noises that really didn't make sense. On July 14, 2015 at around 1:50am a strong thunder storm had just passed over the village of Leesburg. This is when I experienced something I will never forget. It all started with a pounding noise down the hall. Being that the hall was pitch black I was in disbelief, thinking that it was just myself being tired. Shortly after that I observed a door to the office slowly move and creak back and forth about two inches each way. Still talking myself out of believing what my eyes witnessed, I continued working. Around ten minutes later I witnessed the same door creak and slowly move back and forth once again about two inches. At this point I pulled out my phone and was going to record this incident if it happened again. Well it didn't happen, so instead I went out to the garage area to clear my head, only a few steps from the office. When I returned was when I saw what I have never seen in my entire life. 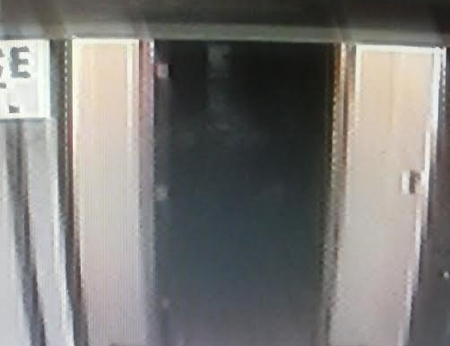 Returning to the office, I saw a shadow figure of what appeared to be an elderly lady standing in the hallway. She was staring right at me wearing a large dress and what appeared to be some type of apron. I was in such disbelief; I opened and closed my eyes several times, and she just stood there. I quickly grabbed my phone and took a photo of this figure I observed. What is the name of the place you work at... I would like to observe some of the paranormal myself... Thank you.